Lactate threshold as a percentage of VO2max has long been associated with distance running and cycling performance. But lactate is not a cause of fatigue. Rather, the accumulation of lactate is an indication of what's occurring. Lactate can accumulate without a change in muscle pH. In fact, lactate production prevents or delays changes in pH. So, could pH threshold be a more sensitive indicator of performance capacity than lactate? Below is data and a graph from a pH threshold test conducted on a treadmill in a lab. From the graph, you can see the lactate threshold falls at roughly 9.5 mph or 6:19/mile. Here, we saw an increase from 3.02 mmol/L to 4.78 mmol/L (+1.76 mmol/L). But note that blood pH did not change from 9.5 to 10 mph (7.38 to 7.37). But, pH did fall between 10 and 10.5 mph. This demonstrates that even though lactate starts accumulating, pH does not necessarily change. In theory, an athlete should be able to maintain a pace in that window above lactate threshold and below pH threshold for a extended amount of time. Here, the cause of fatigue is not likely to be related to lactate or the accumulation of H+ because H+ does not accumulate at this intensity. If acidosis is not the cause of fatigue, what is? The issue with maintaining this pace for extended amounts of time (hours) may stem from glucose availability. Glucose is necessary to run glycolysis and glycolysis is a relatively inefficient source of ATP. So, an athlete will be relying heavily on glucose when creating lactate through glycolysis. Plenty of research has demonstrated positive effects of glucose ingestion on exercise performance from sprint intervals to ultra-endurance events. The CHO group ingested a carbohydrate beverage every 20 minutes. The placebo group was given artificially flavored water. Full Text Link Here. The subjects were asked to cycle to exhaustion at a moderate intensity of ~70% VO2max (well below the pH threshold in trained athletes). CHO supplementation extended the time to exhaustion (TTE) from 3.02 hrs to 4.02 hrs, demonstrating that CHO is an effective ergogenic aid. But, perhaps the most interesting finding from this study is not that CHO maintained blood glucose and extended TTE. Rather, it's that that even in the face of maintained and adequate blood glucose, fatigue still occurs. So, in addition to acidosis and carbohydrate availablity, we have to recognize other potential factors that contribute to fatigue: thermal strain, dehydration and cardiac drift, progressive recruitment, muscle damage, lack of motivation, a central govenor or any combination of these factors. Just as the accumulation of hydrogen ions was not likely the cause of fatigue in the above experiment, H+ accumulation is not likely to be the culprit behind fatigue during marathon running (unless the effort is very poorly paced) because the marathon will be run at an intensity below pH threshold. Regardless, a relationship between pH threshold and marathon running performance has been established (Zoladz et al., 1993). Velocity at VO2max (vVO2) has been cited as a reliable indicator of running performance in a number of studies by a number of authors. But the issue with vVO2max is that it does not take into account changes in blood pH. So while a high vVO2max is generally good, it will not tell you whether a certain pace is sustainable or a certain pace results in acidosis because we cannot predict at what percentage of vVO2max pH threshold will fall. To address this issue, let's call the velocity at which pH threshold is met, vpH. vpH represents more than velocity and blood pH alone - vpH also encompasses aerobic capacity (VO2max), and running economy. If pH threshold is represented as a percentage of VO2max and running economy is similar between athletes, the greater the VO2max the greater the vpH of the athlete at a given percentage of VO2max. Likewise, if VO2max is similar between athletes, the greater the economy the greater the vpH at a given percentage of VO2max. 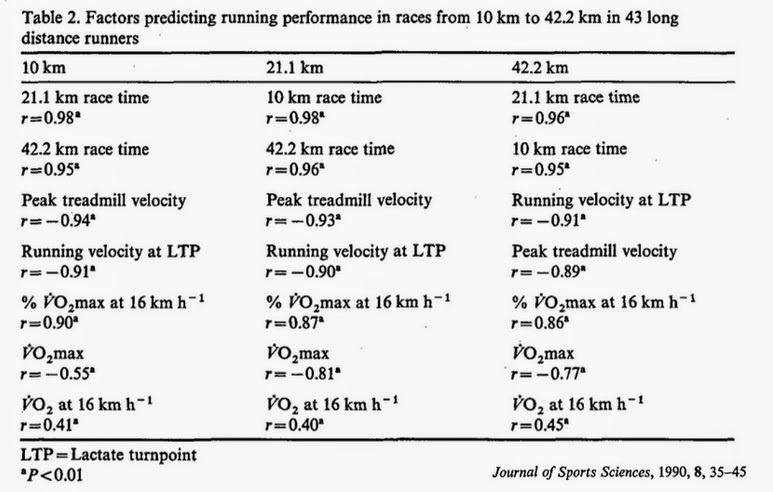 This model of running performance has been laid out many times; the variables VO2max, running economy and lactate threshold being the key determinants. By replacing lactate threshold with pH threshold, we have a more definitive point. Here we know, beyond vpH, acidosis will occur and that velocity will not be sustainable for more than ~30:00. As it turns out, those athletes with the fastest 10K and half marathon times are most likely to have the fastest marathon times. Then why should anyone care about pH threshold if 10K performance will tell you the same thing? Increasing pH threshold will allow an athlete to accumulate a greater training load. That's why I believe short intervals should supersede longer intervals. By increasing pH threshold, the athlete can then run the longer intervals at a greater velocity and percentage of VO2max.